Johnsongrass (Sorghum halepense) is a monocot weed in the Poaceae family. In Louisiana this weed first evolved resistance to Group A/1 herbicides in 1997 and infests Cotton. Group A/1 herbicides are known as ACCase inhibitors (Inhibition of acetyl CoA carboxylase (ACCase)). Research has shown that these particular biotypes are resistant to clethodim, and fluazifop-P-butyl and they may be cross-resistant to other Group A/1 herbicides. One student will be working on this. Nicosulfuron and primsulfuron are used in corn and work well. Also Roundup ready cotton. Continuous cotton. Greenhouse trials comparing a known susceptible Johnsongrass biotype with this Johnsongrass biotype have been used to confirm resistance. For further information on the tests conducted please contact the local weed scientists that provided this information. There is no record of differences in fitness or competitiveness of these resistant biotypes when compared to that of normal susceptible biotypes. If you have any information pertaining to the fitness of Group A/1 resistant Johnsongrass from Louisiana please update the database. The Herbicide Resistance Action Committee, The Weed Science Society of America, and weed scientists in Louisiana have been instrumental in providing you this information. Particular thanks is given to Donnie Miller, and Dearl Sanders for providing detailed information. Hernandez, M.J., R. Leon, A. J. Fischer, M. Gebauer, R. Galdames, and R. FIgueroa. 2015. Target-Site Resistance to Nicosulfuron in Johnsongrass (Sorghum halepense) from Chilean Corn Fields.. Weed Science 63 : 631 - 640. 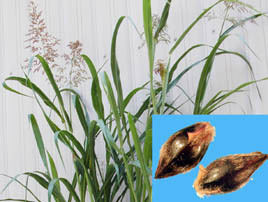 Johnsongrass is a common weed of corn in Chile, which is most often controlled by nicosulfuron, an acetohydroxyacid synthase (AHAS)-inhibiting herbicide. Recurrent nicosulfuron use has resulted in selection for resistant johnsongrass biotypes. We conducted studies to determine nicosulfuron resistance levels in two johnsongrass biotypes from Chile and to investigate if this resistance was target-site mediated. Whole-plant resistance to nicosulfuron was 33 and 46 times higher in resistant (R) than in susceptible (S) plants grown from seed and rhizomes, respectively. The nicosulfuron concentrations for 50% inhibition of AHAS enzyme activity in vitro were more than 11 times higher in R than in S plants. Sequencing analysis of the AHAS coding sequence revealed a Trp-574-Leu substitution in both R biotypes. This study shows that resistance to nicosulfuron in the two R biotypes is conferred by an altered target site. We also report the first consensus sequence of the johnsongrass AHAS gene corresponding to the known mutation sites conferring resistance to AHAS-inhibiting herbicides..
Ferraro, D. O. ; Ghersa, C. M.. 2013. Fuzzy assessment of herbicide resistance risk: glyphosate-resistant johnsongrass, Sorghum halepense (L.) Pers., in Argentina's croplands. Crop Protection 51 : 32 - 39. A fuzzy-logic based model was built in order to assess the relative influence of different ecological and management drivers on glyphosate resistance risk (GRR) in Sorghum halepense (L.) Pers. The model was hierarchically structured in a bottom-up manner by combining 16 input variables throughout a logical network. Input data were related to (1) herbicide usage, (2) crop rotation, (3) landscape characterization, (4) weed dispersal, and (5) mean maximum and minimum seasonal temperature. Mean maximum and minimum seasonal temperatures and the dominance of glyphosate use were the variables that showed the highest sensitivity to input changes. Application of the model at a regional scale resulted in a wide range of GRR values. The lowest range values (lower than 0 and between 0 and 0.25) were represented in 5.5% and 21.5% of the cropping area, respectively. Intermediate GRR range (between 0.25 and 0.5) were assessed in 57.3% of the cropping area whilst the highest GRR range values (0.5-0.7) were represented in only 15.6% of the studied area. The assessment of trade-offs between different ecosystem functions through expert opinion can complement traditional analyses for predicting herbicide resistance risk based on solely the genetic aspect of the evolutionary process..
Vila-Aiub, M. M. ; Gundel, P. E. ; Yu Qin ; Powles, S. B.. 2013. Glyphosate resistance in Sorghum halepense and Lolium rigidum is reduced at suboptimal growing temperatures. Pest Management Science 69 : 228 - 232. Background: Glyphosate resistance in populations of the C4 perennial Sorghum halepense (Johnsongrass) and C3 annual Lolium rigidum (rigid ryegrass) has evolved and been documented in many cropping areas around the globe. In S. halepense and in the majority of reported cases in L. rigidum the glyphosate resistance trait has been associated with a mechanism that reduces glyphosate translocation within plants. Here, the significant decrease in the glyphosate resistance level when resistant plants of S. halepense and L. rigidum are grown at suboptimal cool temperature conditions is reported. Results: Lowering temperature from 30 to 19°C in S. halepense and from 19 to 8°C in L. rigidum significantly reduced both plant survival and above-ground biomass produced by glyphosate-resistant plants. Thus, glyphosate resistance parameters significantly decreased when glyphosate-treated resistant plants of both species were grown under non-optimal temperature conditions. The results suggest that the resistance mechanism against glyphosate damage is less efficient at optimal growing temperatures. Conclusion: It is possible to increase the control of glyphosate-resistant S. halepense and L. rigidum populations by treatment with glyphosate during growing conditions at suboptimal low temperatures. Conversely, glyphosate failure will continue to occur on glyphosate-resistant populations treated during periods of higher temperatures..
Fernández, L. ; Haro, L. A. de ; Distefano, A. J. ; Martínez, M. C. ; Lía, V. ; Papa, J. C. ; Olea, I. ; Tosto, D. ; Hopp, H. E.. 2013. Population genetics structure of glyphosate-resistant Johnsongrass (Sorghum halepense L. Pers) does not support a single origin of the resistance. Ecology and Evolution 3 : 3388 - 3400. Single sequence repeats (SSR) developed for Sorghum bicolor were used to characterize the genetic distance of 46 different Sorghum halepense (Johnsongrass) accessions from Argentina some of which have evolved toward glyphosate resistance. Since Johnsongrass is an allotetraploid and only one subgenome is homologous to cultivated sorghum, some SSR loci amplified up to two alleles while others (presumably more conserved loci) amplified up to four alleles. Twelve SSR providing information of 24 loci representative of Johnsongrass genome were selected for genetic distance characterization. All of them were highly polymorphic, which was evidenced by the number of different alleles found in the samples studied, in some of them up to 20. UPGMA and Mantel analysis showed that Johnsongrass glyphosate-resistant accessions that belong to different geographic regions do not share similar genetic backgrounds. In contrast, they show closer similarity to their neighboring susceptible counterparts. Discriminant Analysis of Principal Components using the clusters identified by K-means support the lack of a clear pattern of association among samples and resistance status or province of origin. Consequently, these results do not support a single genetic origin of glyphosate resistance. Nucleotide sequencing of the 5-enolpyruvylshikimate-3-phosphate synthase (EPSPS) encoding gene from glyphosate-resistant and susceptible accessions collected from different geographic origins showed that none presented expected mutations in aminoacid positions 101 and 106 which are diagnostic of target-site resistance mechanism..